-Bottom: a spacious living / dining room of 35 m², a fully equipped and very functional American kitchen, an adjoining laundry room, an elegant and pleasant bathroom with toilet. -Up: a second toilet and two rooms of character under the roof ridge with exposed beams and parquet floor. One is equipped with a large double bed (160 X 200), the other with a double bed (140 X 190) OR two single beds (70 X 190). The apartment is ideal for 4 people, but it can accommodate up to 8 people including 6 adults, because the living room is equipped with a sofa bed in a double bed (140 X 190) and we can install -on request- in one or the other room a cot (cot 60 X 120) and a fireside chair (60 X 180) for a child. The stairs do not allow the reception of people with reduced mobility. - A first bedroom with a large double bed 160 x 200, night tables, chest of drawers, wardrobe, a fan in summer. - Another room with a double bed 140 X 190 OR CHOICE 2 single beds 70 x 190, chests-tables, wardrobe, shelves, stereo and all kinds of readings, a fan in summer. - A spacious living room: The lounge area is equipped with a leather sofa convertible into a double bed of 140 x 190 with a quality mattress, a second sofa and two armchairs style around a coffee table. Further, another coffee table with a high-definition flat screen TV, a DVD player, an internet box with Wi-Fi. You will also find many board games for young and old. The dining area is equipped with a large oval table and 6 chairs with large backrest. - A bathroom with shower and corner bath, hairdryer, a toilet, towel warmer radiator. - Another WC upstairs, between the 2 bedrooms. 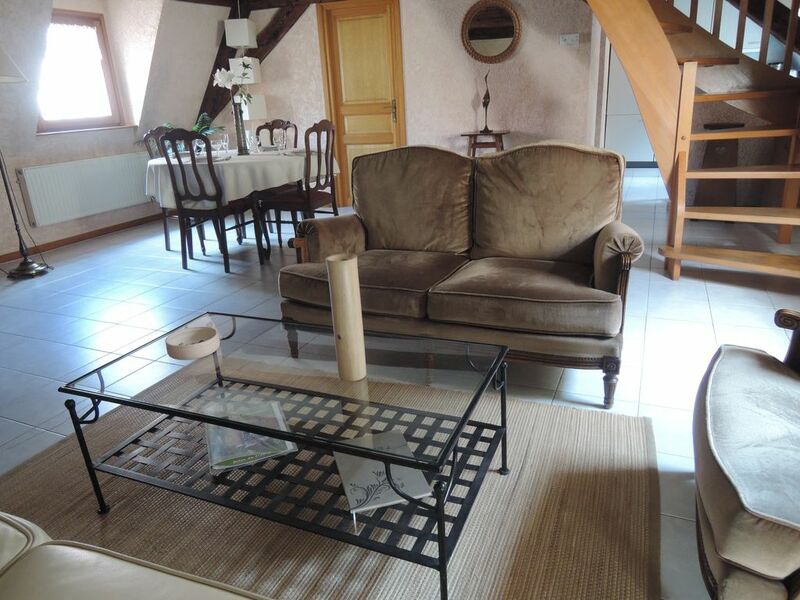 This charming apartment is located in a typical Alsatian house, in the city center, in the heart of the historic center of Colmar, in a quiet pedestrian street but nevertheless and very accessible by car from the Rue des Augustins suite. On one side, you will have a view of Colmar cathedral and Alsatian roofs, on the other, on the courtyard of the old chancery of Colmar. The cottage is also located close to Little Venice, and is centrally located in relation to the 5 Christmas markets in the city of Colmar: All are less than 5 minutes walk from Schongauer Street! This cozy duplex, located in a pedestrian area, is easily accessible and has plenty of parking nearby. We rent from April to the end of September a parking space at Parking Rapp, reachable in 2 minutes from the cottage, easy access by car, and adjacent to the city center. Bed linen and towels are not included in the price, but are available to rent if you wish. You will find the rates in the "Rates" section. Similarly, the end-of-stay cleaning is charged if you want this option. For more information, do not hesitate to contact us (in week preferably of evening): We will answer you with pleasure in French, in German or in English. We lived 10 years in this cozy nest in the city center of Colmar. The birth of our daughter forced us to leave. But as we were very sentimentally attached to it, we are determined to keep it and turn it into cottage to share the city we fell in love with all those who wish to explore the area. This cottage in the city center is particularly well equipped. The bedding is of excellent quality, including extra bedding in the living room. Duvets and pillows (feather or synthetic) are comfortable and clean. We renew them regularly. In general, we pay particular attention to the cleanliness and comfort in this house, our two main criteria. We regularly equip the house with appliances, accessories, products or utensils that would have missed our guests, so that the following are even more satisfied and feel at home. Green plants decorate the place. We like to talk with holidaymakers who want to, talk about our region, recommend the best places in our city and things not to miss in the area. Perfect location in Colmar! Wonderful place to stay for 4 nights with a group of 4 adults and a toddler. We stayed here for 3 nights with our children (ages 12,10, 8) as part of a month-long adventure around France. Stephanie met us at the property and explained all about it and pointed out options for dinner and grocery stores on the map. She was so helpful and friendly and spoke perfect English! The apartment is basic but so are most places we stayed in France compared to American standards -- but the charm cannot be compared to anywhere in the states! We used the washing machine and it worked well. France won the World Cup while we were here and we loved walking around town during the celebrations. The apartment was comfortable, super well located, and very reasonably priced. I feel like it was the best value out of everywhere we stayed the entire month. Our kids' favorite ice cream place from the whole month was Isabelle in Colmar (and we ate a LOT of ice cream over the month so had lots of places to compare!). We ate at a good Italian place the first night and then at Le 3 the second night. Both were good. We walked to various places for croissants and coffee each morning for breakfast. The walk from the train station to the apartment was about 10-15 minutes. Stephanie communicated very well before we arrived and returned our security deposit very promptly when we left. You do have to walk luggage up several flights of stairs and bring your own linens (they are available for a fee) but this was very clearly communicated on the front end so was fine with us. This was an A+ rental experience and I would recommend to anyone! Thank you for your big and lovely appreciation!! That people feels good is so important for us, so we know why we do all that! We stayed here for seven nights, and it was the perfect place for us. Perfectly clean, beautifully decorated, and had everything we needed for a relaxing time. Central to everywhere we wanted to go in Colmar itself, but also to the buses and trains that took us on day trips out of town. The street was quiet and charming. The owner is very thoughtful and helpful. We would definitely choose this apartment again when we return to Colmar! We stayed in this flat for two days and enjoyed our stay. Stephanie was very helpful and welcoming. This is a large flat with practically all the amenities you would need for a vacation. It is located in downtown Colmar and is close to cafes, restaurants, shopping, and local attractions. The property is very nice, clean and has old-world charm to it. It's very quiet and secure but near everything that downtown Colmar has to offer. There are two bedroom able to sleep two people each plus a couch downstairs. Plenty of room for 2-6 people but verify occupancy with the property owners first. It has a large downstairs bathroom with toilet, sink, shower and a garden tub plus a powder room upstairs with a toilet and sink. For Americans, be mindful that light switches are much lower on the wall than we are accustomed to, basically at waist height. Colmar is a very lovely city and it's certainly worth the trip. I would recommend this property as it was as-advertised, clean and quiet. Stephanie and Olivier were super-sympa and very easy to work with! We visited Colmar for Christmas market and this apartment was the perfect place to stay. On a quite street just a few short blocks from all of the markets. It is also an easy walk from all other places in the old city. The two bedroom apartment is very spacious and has all amenities you might need during your stay. I recommend it very highly for any visit to Colmar. This spacious second floor self-catering apartment is in a narrow pedestrian street almost in the heart of the picturesque historic centre of Colmar. We were able to stop outside the apartment to unload our car, but soon warned to move on by a patrolling official. The only free parking area is located several blocks away but not well marked and very full on a Friday night. Owner Stéphanie pedalled over to let us in, seemed a bit reserved and formal (this was the only place we stayed where the owner asked for a signed lease agreement, 250 Euros security deposit, extra charge for linen, and expected all cleaning and vacuuming to be done before departure!) Apart from having to indulge the owner's cleaning fetish, the only other real negative was that we found the pillows quite hard and uncomfortable. Otherwise a perfect place to stay and enjoy the amazing and very popular attractions of Colmar. We specify on our internet ad and on the rental agreement that there are optional charges (sheets, towels, cleaning) and that we ask a deposit of 250 € on arrival. Indeed, it seems to us more pleasant that our prices are adjusted according to the requested options. Thus, a family who takes care of all the "details" is happy to pay less, and we too, because it gives us much less work. Finally, we must take the time to read the announcement before booking and commit. We offer two kinds of pillows: feather pillows AND synthetic pillows. But you have to take the time to open all the closets and wardrobes! Nous précisons bien sur notre annonce internet et sur le contrat de location qu'il y a des frais optionnels (draps, serviettes, ménage) et que nous demandons une caution de 250€ à l'arrivée. En effet, cela nous paraît plus agréable que nos prix soient ajustés en fonction des options demandées. Ainsi, une famille qui se charge de tout les "détails" est heureuse de payer moins cher, et nous aussi, car cela nous donne beaucoup moins de travail. Finalement, il faut donc prendre le temps de lire l'annonce avant de réserver et de s'engager. Nous proposons deux sortes d'oreillers: des oreillers en plumes ET des oreillers synthétiques. Encore faut-il prendre le temps d'ouvrir tous les placards et toutes les armoires!